Lovers of big full-size four-door cars aught to be giving Toyota a collective slap on the back, not to mention anteing up for its completely redesigned 2019 Avalon luxury sedan. That said they should also be lovers of off-the-charts mechanical aeration and otherwise eccentric styling cues front to back, because the new Avalon lays to rest any preconceived notions of conservatism initiated by the yawn-inducing 1995–1999 first-generation model, or for that matter the oddly proportioned yet still boring 2000–2004 version, the much improved yet nevertheless forgettable 2005–2012 third-gen car, and (IMHO) the quite elegant and therefore best-yet 2005–2012 fourth-generation model. While I opined against the oversized grille that visually weighed down the outgoing model, this new 2019 Avalon breaks the mould that previously cast the world’s largest engine vents, now staking claim on the ultimate gaping maw award, if there ever were such an accolade. My goodness what were they thinking? This design must be targeting a different market than North America, or possibly Toyota knows something about its aging Avalon demographic that we don’t, but boy-oh-boy this is one mind-bogglingly bizarre front fascia. At least it’s not boring, our tester’s base XSE trim line (a new designation for this model) making matters more unusual by substituting the top-line Limited model’s chrome for loads of glossy black detailing most everywhere that wasn’t tastefully painted in an earthy metallic dubbed Brownstone. The new Avalon’s previously elegant rear quarters have been radicalized too, from a design I could have easily called beautiful to one that’s been hit with the Prius stick. Ok, it’s not quite as whacky as the world’s best-selling hybrid, but it’s revolutionary to the eyes thanks to a multi-angled taillight cluster featuring a body-wide light bar at centre, this branded with “AVALON” block lettering in the middle. A tastefully small “XSE” badge lets passersby know you didn’t spend as much as Avalon Limited owners, or alternatively that you’re an Av buyer that likes your ride on the sportier side. Ok, you’ve got to know that last comment was made with tongue firmly planted in cheek. Despite the outgoing model being a decent handler, better even than some direct competitors, one of which is professed to be a “four-door sports car” yet when the road gets bumpy has trouble maintaining contact with pavement due to an overly rigid chassis, Avalon customers wouldn’t normally be associated with those seeking performance first and foremost. 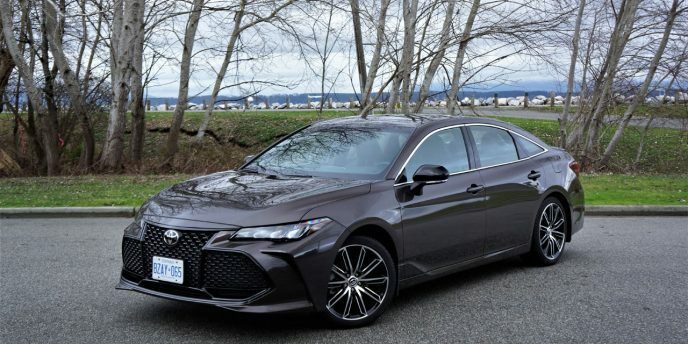 Fortunately, a byproduct inherent in the new 2019 Avalon is a much-improved chassis architecture shared with the equally improved Camry, albeit lengthened to the same proportions as the recently redesigned Lexus ES 350/300h, which is also a much better performer than its forebears. It’s a bit large and soft to be considered a sport sedan, but the Av can now credibly zig and zag alongside its comparative rival from Nissan, not to mention other full-size front-drivers like the Kia Cadenza, Buick LaCrosse, Chevrolet Impala, and Ford Taurus. This said it’s no challenger to now premium mid-size models like the Genesis G80, a model that previously wore the Genesis nameplate under the Hyundai brand, while it’s also no match for a fully equipped Chrysler 300 or Dodge Charger, which are also the sales leaders in this class. This brings up what may be an interesting question: With sales of large sedans falling off the proverbial cliff, and various models within this segment being accordingly axed to make way for crossover SUV replacements, or so we’re told, why has Toyota, with some of the lowest sales in this class, chosen to completely redesign the Avalon? The answer may have little to do with the Av itself, and more to do with the aforementioned Lexus ES 350 it shares production space with. The ES is one of Lexus’ more popular cars with U.S. sales of 48,482 units last year and 1,808 sold over the same 12 months in Canada, which when added to 33,580 Avalons purchased south of the 49th and 626 bought here (the latter number representing year-over-year growth of 41.0 percent), combines for 84,496 units. While a reasonable argument can be made for keeping the ES within Lexus’ lineup, especially when considering it’s also sold elsewhere, but the Avalon hardly seems like a worthwhile venture. To put it in perspective, Ford just cancelled its full-size Taurus that found 40,341 U.S. and 2,812 Canadian buyers last year, a car that shares underpinnings with the Lincoln Continental that will also be discontinued despite 8,758 U.S. and 438 Canadian sales (which is nowhere near least popular in either market), while General Motors just announced the cancelation of its fraternally twinned Chevy Impala and Buick LaCrosse, the former growing its numbers by a shocking 26.8 percent to 3,903 units in Canada, thus beating the aforementioned Chrysler 300 to second place behind the Dodge Charger (LaCrosse sales were down 27.9 percent). The Impala was already in second in the U.S. with 56,557 deliveries in calendar year 2018, making it a much bigger seller than the Avalon, yet it’ll soon go the way of the dodo while Toyota’s large car entry soldiers on. Even the afterthought Buick sells stronger than the Avalon in Canada, managing 664 units last year, although its 15,527 U.S. total will mean that few will miss it south of the border. Other large mid-size models will soon be sent to the chopping block too, including Chevy’s Malibu (with 6,822 unit sales in 2018), Ford’s Fusion (with 6,350 units) and Lincoln’s MKZ (833 units) (somehow Buick’s Regal, that sold just 799 examples last year, was saved), whereas near full-size mainstream models that (like the Avalon) find fewer buyers, such as the Maxima that saw a sales decline of 38.6-percent for 1,357 units last year, or the Kia Cadenza that lost 33.1 percent for a near nonexistent 83 deliveries throughout all of 2018, are continuing on. It seems nonsensical to those on the outside of such decision-making boardrooms, but each automaker has its reasoning and, to make a short story long, the renewed Avalon will continue to exist in a market segment that’s saying goodbye to the Impala, LaCrosse and Taurus. 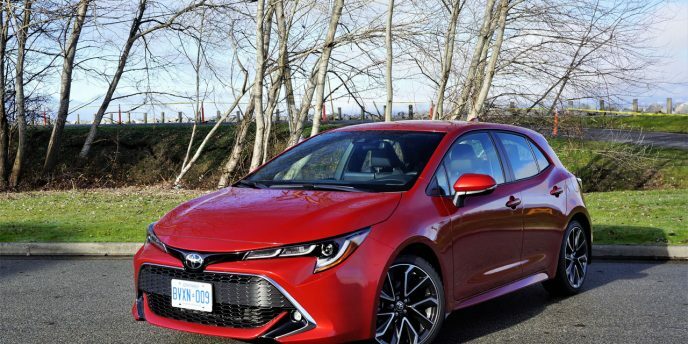 As it is the redesigned Avalon offers a lot to traditional mid-size sedan buyers that want to step up into a larger, more luxuriously appointed car. Upwardly mobile Camry buyers seem like the obvious target market, the larger Toyota measuring 100 millimetres (4.0 inches) more from nose to tail, with a 50-mm (2.0-in) longer wheelbase, while it’s also 10 mm (0.4 in) wider than the more affordable sedan, albeit fractionally lower by the same 10 mm (0.4 in) measure. This said the new 2019 Avalon is larger than the already sizeable outgoing version, its overall length having grown by 20 millimetres (0.8 inches) to 4,980 mm (196.0 in) and wheelbase by 50 mm (2.0 in) to 2,870 mm (113.0 in), while it’s now 15 mm (0.6 inches) wider at 1,850 mm (72.8 in), but following a trend is now 20 mm (0.8 inches) lower overall at just 1,440 mm (56.5 in), resulting in a leaner more athletic look. The new Av backs up its sportier styling with more oomph under the hood, its massaged 3.5-litre V6 now outputting 10 more horsepower and 17 additional lb-ft of torque for 278 of the former and 265 of the latter, while in XSE trim this newfound performance is complemented by an “Engine Sound Generator” enhanced exhaust note that gets artificially amped up when Sport mode is switched on. What’s more, the entirely new eight-speed automatic transmission (not a CVT like one of the Avalon’s supposedly sportier competitors) that replaces the old six-speed unit even comes standard with (wait for it) paddle shifters. Yes, Toyota truly is trying to upset the mainstream volume-brand luxury car applecart, but it gets better still. Underpinning the new Avalon is an extended version of the stiffer, more agile chassis that improved the most recent Camry, and likewise makes the new Lexus ES 350/300h more enjoyable to live with, the XSE’s front struts and rear multi-link setup even sport tuned and matched up to one-inch larger 19-inch alloy wheels on 235/40 all-seasons, my tester’s produced by Continental. The Avalon smartly picks up where the Camry leaves off, the latter retailing for $41,090 plus freight and fees in top-tier XLE V6 trim and the base Avalon XSE starting at $42,790 (see all 2019 Avalon trims, packages and option pricing, plus rebate info and dealer invoice pricing that could save you thousands at CarCostCanada), but don’t expect to get all of the fully loaded Camry’s features in base Avalon form. I won’t detail out my disappointments in this abbreviated garage preview, but will instead go over a few highlights starting with a standard gauge cluster featuring a 7.0-inch digital multi-information display wedged between two analogue dials, which intelligently doubles up route guidance instructions in this easier to view location when the navigation system is in play, amongst numerous other functions. Atop the redesigned centre stack is a large 9.0-inch touchscreen featuring Toyota’s Entune infotainment interface as standard equipment that, like Apple CarPlay and Android Auto, lets you connect to functions, music and info such as traffic conditions, fuel stations, weather forecasts, stocks and more via a variety of apps such as Scout GPS Link, Yelp, Slacker, NPR One and more through your smartphone. iPhone users will appreciate that Apple CarPlay also comes standard (but there’s no Android Auto), as does a wireless smartphone charger, SMS/text- and email-to-speech functions, advanced voice recognition, a 14-speaker 1,200-watt JBL surround sound audio system with satellite radio, Bluetooth streaming audio, four USB charging ports, and more, while Entune Safety Connect provides automatic collision notification, stolen vehicle locator, an emergency assistance (SOS) button, and enhanced roadside assistance. Some other noteworthy standard features include LED headlamps, LED taillights, proximity-sensing keyless access, pushbutton ignition, an eight-way powered driver’s seat, six-way powered front passenger’s seat, heatable front seats, an auto-dimming rearview mirror, a universal garage door opener, and dual-zone automatic climate control, while standard advanced driver assistance and safety systems include automatic high beams, adaptive cruise control, autonomous emergency braking with pedestrian detection, lane departure alert with steering assist, blind spot monitoring and rear cross-traffic alert, and more. Toyota redesigned the Highlander for the 2014 model year, giving it much more character and impressive refinement inside, while upping the maximum seat count from seven to eight, and then after just three years they replaced the simpler truck-inspired front grille and fascia for a ritzier chromed up look that certainly hasn’t hurt sales. Its popularity within its mid-size crossover SUV segment grew from eighth in the 2016 calendar year, when the updated model was introduced, to seventh the following year, while after three quarters of 2018 it’s risen to fifth overall and just third amongst its dedicated three-row peers. The Highlander is still one of the better looking mid-size crossover SUVs from the rear. Obviously Toyota sees no reason to change much for 2019, so the full-load Limited model in our garage this week only gets a nice new set of LED fog lamps. This is true for both the conventionally powered model and our Highlander Hybrid tester, the latter being the only mid-size SUV within the mainstream volume sector to be offered with a hybrid-electric powertrain. Think about that for a moment. SUVs are taking over the entire automotive market, and electrification is supposedly our future, but only Toyota offers a hybridized mid-size SUV. Like so many things in life, this doesn’t make a lot of sense. Kudos to Toyota, mind you, that’s been leading the way for more than a dozen years. Here’s a slightly closer look at the new LED fog lights, plus the Limited model’s dark chrome five-spoke alloy wheels. Hybridization means Toyota swaps out its standard 295-horsepower 3.5-litre V6 for the same engine running on a more efficient Atkinson cycle, which when mated to two permanent magnet synchronous electric motors, one for driving the front wheels and the other for those in the rear, plus a sealed nickel-metal hydride (Ni-MH) traction battery, results in 306 horsepower and an undisclosed amount of torque that’s no doubt more than the 263 lb-ft provided by the gasoline-only variant. Additionally, the regular Highlander’s advanced eight-speed automatic is replaced by an electronically controlled continuously variable transmission (ECVT) with stepped ratios to mimic the feel of a traditional gearbox, plus a sequential shift mode for getting sporty or merely downshifting while engine-braking, and as sure as rain (or should I say snow this time of year) its aforementioned all-wheel drivetrain takes care of slippery situations. 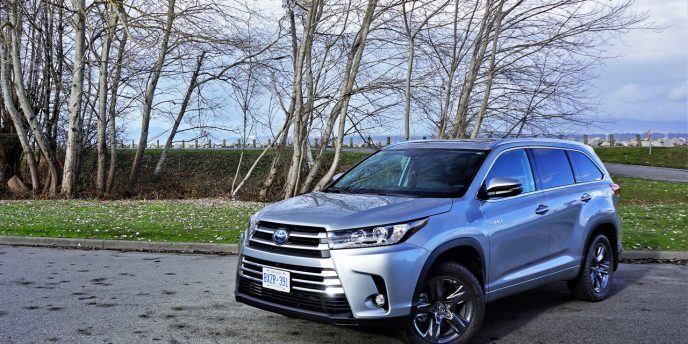 At $50,950 plus freight and fees the 2019 Highlander Hybrid doesn’t come cheap in base XLE trim, while this upgraded full-load Limited model hits the road for a whopping $57,260, but then again a similarly optioned 2019 Chevrolet Traverse High Country comes in at an even loftier $60,100, and the only slightly nicer 2019 Buick Enclave Avenir will set you back a stratospheric $62,100, and they don’t even offer hybrid drivetrains, so maybe the Highlander Hybrid Limited isn’t so pricy after all. 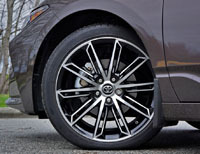 By the way, check out CarCostCanada for detailed pricing of trims, packages and options, plus money saving rebate info and dealer invoice pricing that could save you thousands, whether purchasing the new 2019 Highlander, 2019 Chevy Traverse, 2019 Buick Enclave, or any other mid-size crossover SUV. Most everyone expected Toyota to enter the subcompact SUV segment at some point, but showing up with a sportier, smaller than average entry, and therefore putting styling ahead of practicality was surprising to all. 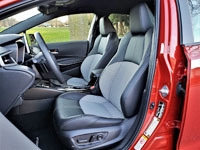 After all, the segment sales leaders make it clear that passenger/cargo roominess and flexibility is king, with models like the Honda HR-V, Kia Soul, Mazda CX-3 and Subaru Crosstrek dominating up until this year, and newcomers like the Nissan Qashqai and Hyundai Kona finding strong sales due to their pragmatic approach and more. It’s as if the new C-HR picked up where the now discontinued Nissan Juke left off (that latter SUV replaced by the new Kicks), albeit without the Juke’s stellar performance. C-HR sales haven’t exactly been abysmal, that dejected title belonging to the Fiat 500X that only managed 69 sales over the first nine months of 2018 (with 548 Canadian sales for the entire brand so far this year, Fiat’s days are likely numbered in the North American markets), while Jeep’s Renegade hasn’t been tearing up the sales charts either with just 1,000 units down the road, but the C-HR’s 5,188 deliveries (placing it eighth out of 13 models that have been available all year) are nowhere near as strong as the new Hyundai Kona’s 10,852 units (and it’s only been available since March), while the aforementioned Qashqai has been killing it with 14,755 sold as of the close of Q3 2018. Crosstrek deliveries remain strong at 11,147 units over the same nine months, while the CX-3 was at 10,207 sales, the Soul at 9,226, and the long-in-tooth HR-V at 8,155 deliveries (a refreshed 2019 HR-V should help matters moving forward). 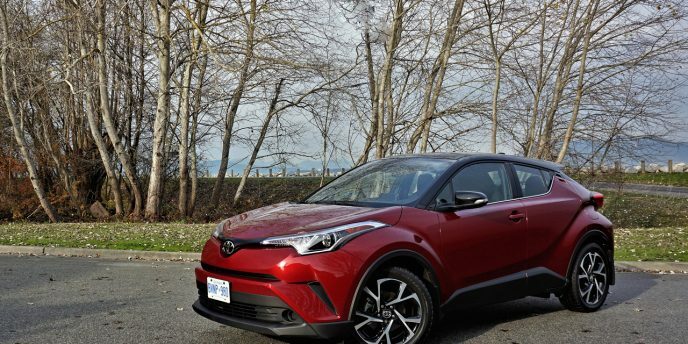 Should we call the C-HR a rare sales dud from Toyota? The Japanese brand certainly appears to have missed the mark, but that doesn’t mean it’s a poor choice for those who don’t need as much interior space. In fact the new C-HR, now in its second model year after arriving on the scene in May of 2017, is quite a nice subcompact SUV. I won’t go into just how nice in this garage segment of this 2019 C-HR Limited version, but suffice to say it combines mostly comfortable cruising with the majority of its peers’ high-level features, reasonably good performance and excellent fuel economy. The 2019 C-HR gets some significant changes that should help it find more buyers, starting with a new base LE trim level that chops over a $1,000 from the 2018 model’s base price. Still, $23,675 is hardly as affordable as some of the sales leaders mentioned earlier, the Qashqai still only available in 2018 trim yet its 2019 counterpart shouldn’t sell for much more than its current $19,998 base price despite the new Nissan Kicks arriving as the segment’s best bargain at just $17,998. Another factor against the C-HR’s success is the fact you can get into the much larger and more accommodating Nissan Rogue for about $3k more than the base C-HR, while the all-new 2019 RAV4 starts at just $27,790 (find new vehicle pricing for all makes and models including the C-HR and RAV4 at CarCostCanada, with detailed info on trims, packages and options, plus otherwise hard to get rebate info and dealer invoice pricing that could save you thousands). That base C-HR LE gets Toyota’s new Entune 3.0 infotainment system, which now utilizes a larger 8.0-inch touchscreen and supports Apple CarPlay smartphone integration (if you can’t beat ‘em, join ‘em). Even better, the new display now incorporates the C-HR’s backup camera, which instead was fitted within the rearview mirror in last year’s model and therefore ruddy useless. Entune also includes the ability to link a Scout GPS smartphone app to the centre display for navigation purposes, plus Entune App Suite Connect that features separate apps for traffic, weather, Slacker, Yelp, sports, stocks, fuel and NPR One, although I don’t know how the latter U.S.-specific National Public Radio station will do anyone in Canada much good. Additional base features worth noting include automatic high beam headlights, adaptive cruise control, remote access, an acoustic glass windshield, auto up/down powered windows all around, a leather-wrapped shift knob, a 4.2-inch TFT multi-information display within the gauge cluster, an auto-dimming rearview mirror, illuminated vanity mirrors, dual-zone auto climate control, six-speaker audio, piano black lacquered instrument panel trim, fabric upholstery, front sport seats, 60/40-split rear seatbacks, a cargo cover, autonomous emergency braking with pedestrian detection, lane departure alert with steering assist, all the usual active and passive safety features including a driver’s knee airbag and rear side thorax airbags, plus more. Last year’s sole XLE trim level is mostly carryover for 2019 other than its higher $25,725 price and new Entune 3.0 Audio Plus that features the larger touchscreen while including automatic collision notification, a stolen vehicle locator, an emergency assistance SOS button, and enhanced roadside assistance, with additional features including 17-inch alloy wheels, a leather-wrapped steering wheel rim, upgraded cloth upholstery, heatable front seats, and two-way powered lumbar support for the driver’s seat. The $27,325 XLE Premium package adds 18-inch alloys, proximity-sensing access with pushbutton ignition, heated power-folding side mirrors with puddle lamps, blindspot monitoring with rear cross traffic alert, and lane change assist. 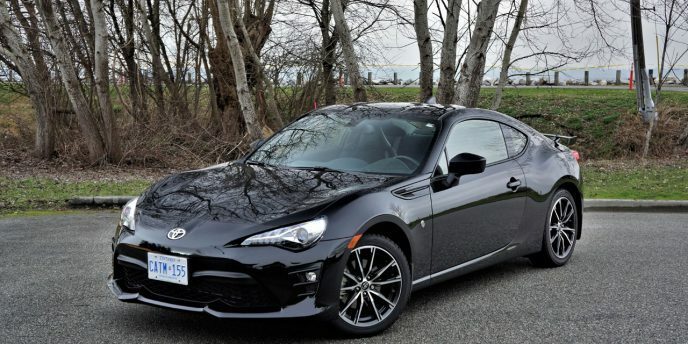 Also new for 2019 is as-tested $28,775 top-line Limited trim that adds rain-sensing wipers, a handy windshield wiper de-icer, ambient interior lighting, and leather upholstery in black or brown. While two new trim levels and upgraded infotainment are improvements over last year’s C-HR, the sole 2.0-litre four-cylinder engine might leave some potential buyers (especially those coming out of the aforementioned Juke) feeling like its performance doesn’t measure up to its sporty exterior design due to just 144 horsepower and 139 lb-ft of torque, a continuously variable transmission (CVT) with a focus on fuel economy, and no all-wheel drive option, front-drive being the only driveline configuration available. Then again, if you’re looking for a sporty looking SUV with good fuel economy the C-HR’s claimed 8.7 L/100km city, 7.5 highway and 8.2 combined rating might be just what your inflation deflated personal budget requires.